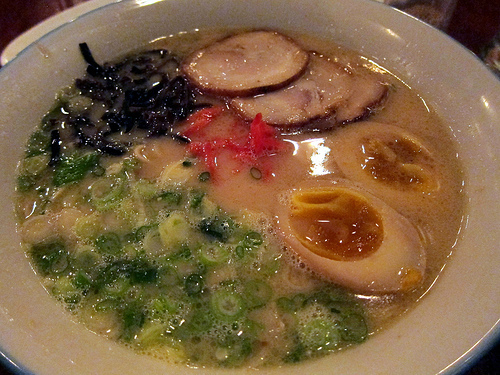 While I was in New York, I had a ramen craving. Did I go to the ones I had mentally placed on my NYC eats list? No! I found the nearest Japanese restaurant that served ramen to the Andaz 5th Avenue where I was enjoying the Manhattan Cocktail Classic Industry Invitational seminars. 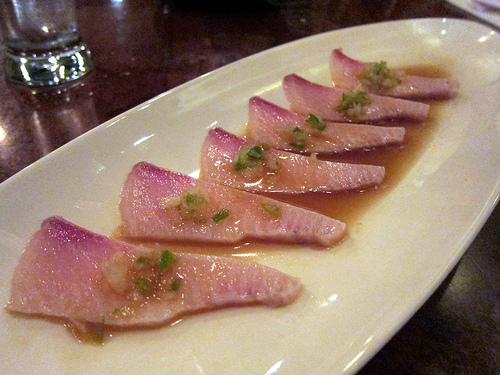 Ronin, it turned out, was a roomier restaurant than what I was used to in NYC. Once inside, you pass a bar and go down a narrow hallway to a large dining room. The groups dining reminded me of Japanese salary-men. Sake bottles lined the walls and there was a quiet seriousness about the place. My friend and I shared the yellowtail sashimi with jalepeno to start. 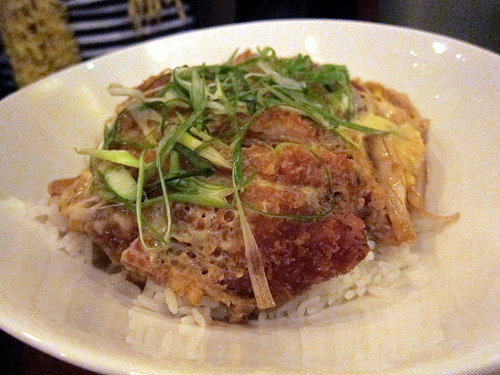 Our server was pushing uni (sea urchin) on us but I didn’t feel like uni that night. The yellowtail was fresh and it gave us time to catch up on our day. The quality of the fish made me wish I was getting more but I was set on something “comforting” so ramen it is. I do think their quality was better than Mishima. My friend had the filling pork katsu don. I considered the options for ramen; tonkotsu, shoyu, miso and kara miso (spicy miso). I always go for tonkotsu. The fattier the pork broth, the better. This broth was on the thinner side and not as fatty as Daikokuya in LA. I did enjoy the leaner pork and the generous amount of wood ear and perfectly done soft-boiled egg. Ronin does serve the rice bun burgers so if I was in the NY again, I might have to seek those out.